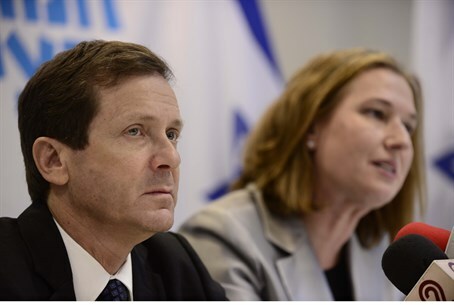 The recently merged parties Labor and Hatnua have until now carefully listed the name "the Zionist camp" in their ads and posters, that being the name Labor head Yitzhak Herzog and Hatnua head Tzipi Livni chose to represent their joint list. However, the two apparently decided the name wouldn't sell as well in Arabic - their new ad campaign targeting the Arab voter removes the name in favor of "the Labor party for peace and equality," reports Channel 10. The words "the Zionist camp" that are prominently featured on all of Labor's ads don't appear in the Arabic ad at all, which shows a large picture of Herzog next to the Arabic text. "(Herzog) together with Livni established a party that is embarrassed of our most basic values. (David) Ben-Gurion is turning in his grave," said the Jewish Home party in a response statement to the ad. Labor has been showing strongly in the polls, getting over 20 mandates and running roughly neck and neck with Likud as the largest party. It has traditionally had a strong Arab voting base, largely due to its generally perceived focus on worker's rights.